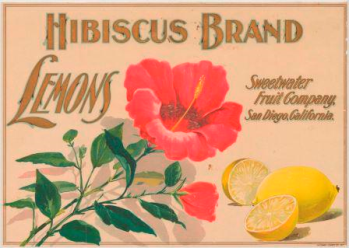 By the 1880s, California’s citrus industry was growing by leaps and bounds. Easterners happily consumed oranges coming by the trainload from the Golden State. Colorfully decorated fruit crates helped promote both citrus and the state of California. In the 1890s, independent fruit growers decided to band together in growers’ exchanges or cooperatives as a means to better protect themselves from economic risk and to represent growers’ interests. By 1905, the association with the highest number of grower-members was the California Fruit Growers Exchange, later known as Sunkist Growers. An endless variety of fruits and vegetables could be successfully cultivated in California, and the state became known throughout the world for its bountiful crops. California’s produce could reach a wide and sometimes distant audience through distribution by ship, rail, and later by truck. Canned fruits and vegetables became another way that California’s crops reached far-flung consumers. As with crates, attractive labels were attached to cans.